In July, a buzz was in the air. The Portland Art Museum's Clement Greenberg exhibit (through Sept. 16) forced us to think about something other than Portlanders, opening up a new era. The weather was beautiful and for some odd reason the galleries combated the sunshine with cheery themes like death, disease and a Fat Tuesday party. Maybe all the almost-gothic morbidity was an elegy/celebration for the end of a static/musty local art world. Or was it a way to combat the idea that summer shows are lightweight? Am I detecting a subtext of communal intelligence developing, or is it just coincidence? The current Duane Hanson exhibit opens up a Pandora's Box of prickly issues. Hanson's sculptures imitate nature, complete with real clothing and informal posture. Yet, the illusion is often disturbingly incomplete and therein lies their worth. Hyper-real, these sculptures act upon the viewer a little like cheese in a mousetrap. Often, out of the corner of the eye, one mistakes them for real people. When perceived as not quite kosher (the skin has a uniform sheen and mammals should be covered in tiny hairs) the curious viewer looks harder and -- whack! -- Hanson lets loose the pathos of a banal, middle-class existential tragedy. If these works were completely deceptive we probably would ignore their human condition. These sculpture, or visual "traps," address demographic queues and create an allegory of leveling microeconomics, where each individual is uniformly disaffected with their niche. Everyone looks pathetic and defeated. Each sculpture is a character (cleaning staff and security guards are favorites) whose social status and role in life is clearly apparent through their accessories. 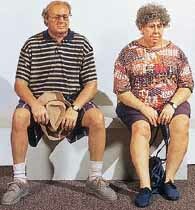 Hanson's "Old Couple on a Bench"
In "Old Couple on a Bench," the overweight pair is dressed in Kmart-esque clothes common 15 years ago. Posture-wise, they seem oppressed by the summer heat -- bushed from all the fun retirement has offered. The bench, like something out of a Thomas Hardy novel, provides the deistic allegory for retirement (sit down -- you are no longer useful, this is now your role). Without breath and toupee-ish hair, Hanson's work does not evoke the noble vitality of life and, instead, everything resembles death. All his works are elegies, although the polychromed bronzes like "Old Couple" are superior to the bondo and fiberglass simulacrum. Why are we not fooled? Most animals can intimately sense death, and I kept seeing the family dog, lying in his kennel too still for life, as I cruised around the space. Even the scale of the people seems diminished, like Grandpa in the casket. There is debate whether Hanson is all technique, but I propose he lacks that very facility. This isn't photo-realism, this is fatal-realism. What he is good at is evoking the omnipresence of death in life. Damien Hirst's formaldehyde shark (below) would be a great curatorial choice to pair next to "Man on a Mower." I'd call the show "Death: everyone is doing it!" Actually, I hate that sort of curatorial "connect the dots" methodology. Two years ago Heidi Schwegler proved the Oregon Biennial could have some teeth. It was obvious that she was good -- maybe too good. The problem: Portland galleries often make the mistake of booking themselves two years in advance (as if nothing exciting will pop up). Schwegler was and is exciting. Her penchant for oral fixations, candy colors and medical pathology are challenging stuff. Because she deserved it, PDX Gallery gave her a window project and that small sample set my expectations very high. The wait wasn't long. Schwegler's solo show at Savage's large back gallery sets some new precedents, putting her on an aesthetic collision course with the hottest, most relevant European artists in the last 20 years. How's that for drama? Yep, drama in Portland. Now that is precedent! The show begins with "Index," which reprises the small jewel-like creations seen in the 1999 Biennial. 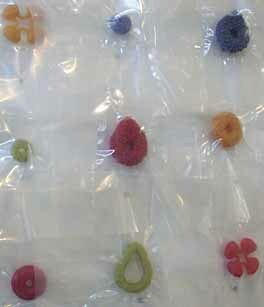 But instead of devices for any imaginable orifice placed in a display box like the Biennial, "Index" hangs jewel-like re-creations of diseased tissue in nice surgical bags. The presentation is more lab-like than the salesmanship of the earlier work. There is containment, but the baggies don't seem like a foolproof barrier between the viewer and contagion. Also, the presentation instills more fear and churlish love of baubles by bringing them closer to us. These are innate truths, and the sphinx-like nature of "Index" makes it first-rate work -- not easily summed up and always worthy of another look. Schwegler considers disease a "genetic gift" and an "heirloom" -- the connection between an individual and the human race's mutual fear of pathology. I suspect this is language designed to bridge the antipodes between her love of bauble-esque beauty and her innate fascination with disease. It is no wonder that she was trained as a jeweler; the human mind can be impressive in its ability to find commonality. More traditional graphic works, like "Health" and a margin of "Tolerance 1" (a more traditional painting) are much less of a synthesis and more of a textbook page. That work, with its illustrative head-restraint hardware and child, has literary resonance but isn't as rich in tacit visual information as "Index." These illustrations are a bit too didactic. Yes, happiness is a choice -- especially in the developed world -- but this work is a visual one-trick wonder, referencing our reactions against a predicable tableau. In essence, the obvious made more obvious. The same didactic message is ingrained in "Index," is more effective since it's not so distanced and is more explicit. Reality enhances the threat as we can avoid the textbook version easier than the actual "heirloom," now made into a jewel or candy. Similarly, half the show is spent comparing images of glamour/beauty and diseased tissue in light boxes resembling those used for reviewing x-rays. This is more predictable photojournalism and is spread over 20 pieces. Three works would have made the same point as the 20. But, then again, I can't stand the harmonic predictability of an hour-long J.S. Bach concert. So the Schwegler might be in good company. The show's centerpiece is the hanging tableau of "Legacy," a real breakthrough. 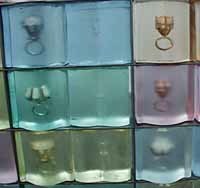 The large square is tethered from the ceiling and the banal coloring of the transparent blocks seem pleasant enough, even though the sterling silver rings inside are set with more diseased tissue samples. There is a visual feast here: within the colored squares, everything is slightly obscured and heightens the disgust/curiosity Schwegler is staking out for her subject matter. Do we want to see the disease and the pretty but banal bauble in more focus, or do we want the issue obscured more with a heavily frosted surface treatment? Hypothetically, obscuring the tissue would turn "Legacy" into a formal abstraction and more clarity would render both too descriptive, like the light boxes. In her way, Schwegler has found the Bermuda Triangle for beauty and disease. A myth/mystery/fear develops in this strange region of space and I'm left wondering if both beauty and disgust are unavoidable and necessary. At least we can avoid the strange forces of the Bermuda Triangle by vacationing elsewhere. Yet it is presentation that Schwegler wields with the most inhibition. Damien Hirst's "The Impossibility of Death in the Mind of Someone Living"
British artist Damien Hirst has arguably been the master of presentation in art for the last 15 years. He is also very taken with the medical "parafinalia" and the display of specimens -- often creatures in formaldehyde. With his precedent, one has to wonder: can Schwegler go beyond the distanced presentations that both she and Hirst use to similar effect? Only then can she press on farther past the laboratory and into that even pricklier world of day-to-day life and contagion. Kristi Edmunds: What has she gotten herself into! Increasingly, Kristi Edmunds has become more known for her role as El Capitan of the Portland Institute for Contemporary Art. Is she still an artist? 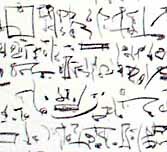 Hopefully, this show should settle some local politics with her installation of a huge personal, handmade letter in shorthand code on Savage's wall. (We live in a tense, paranoid age and the scrutiny is important.) Locally, a few have been uncomfortable with PICA's snuggling up with Weiden & Kennedy -- and saw the "design oriented and minimalist " shows as proof that PICA was the public relations dog of the large and powerful ad firm. Part of it stems from some of Marx's ideas that minimalism removed the trace of the worker's handicraft. Therefore, the product could be more easily co-opted as a purely capitalist icon associated as market product, not a worker's labor. 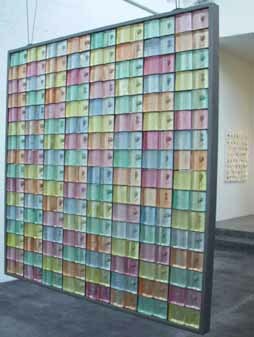 In the wake of the WTO, this sort of thought is understandable and in this show Edmunds shows she is still an artist. The work is personal and generally curious, not some poster child of corporate America. Wow, the things artists get into! Whoever said that the age where ideas mattered was "dead" is patently wrong. Edmunds is not an artist who produces a lot of work. She tends to mull over a number of ideas then makes whatever it is in a very compressed period of time. Her tastes are wide, and this time she created a text in a cipher that she made up as a child. Close-up of Kristi Edmunds' "Letter #1: Imagining How One Gets There From Here (A Letter Regarding a Red Boat)"
In "Letter #1," Edmunds' discreet language conveys rapidity, but it all seems familiar. 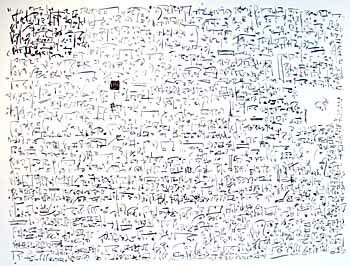 The glyphs scroll across the wall with a loose natural spacing and a sureness that is at times controlled. At other times, large erasure swipes, arrows and diagrams seem to describe the making of the very installation we see. The black and white is elegant, but also evokes the daring child with a crayon who draws on walls. In a way, the whole work seems like the short attention span theater of a 3-year-old who simply does something because it is interesting and they can. This is a strength. Kristi Edmunds' "A Memento for Tracy"
My favorite of Edmunds' work, "A Memento for Tracy," is more improvised and nonchalant. 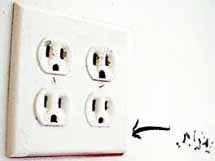 With its arrow toward the power outlet, black sputters and a bit of black inside the prong openings, it threatens to overwhelm the larger piece. It's reminiscent of a child's unruly "hey, mom, see what I made for you ..."
The viewer really has no idea what this memento actually means, although the glyph marks are more haphazard and "dotty." I dig that. One can come away from this exhibit with a sense of something the Greeks called "dromena," or "things done." Edmunds does things because she can. It's an impulse and the things done are usually provocative. The show gives a glimpse into the impulsive soul of PICA and has a lot of Edmunds' unruliness in it, jumping from film to dance to installation. This sort of bouncing gets confusing on a corporate résumé and that's why PICA has survived -- not by some master corporate plan, but as a fresh opportunity to do things. Certainly, it would be duller without it. Some day Edmunds might be able to separate her existence from PICA. But let's hope it is not soon. 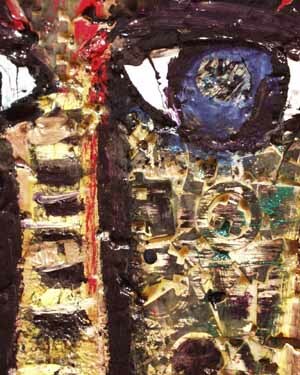 Detail of "Oblong Head"; see full view above. My favorite work of gallery art in July was "Oblong Head" by outsider-artist Anne Grgich. This thick stew of puzzle pieces, congealed paint and glitter is reminiscent of Georges Rouault (if he had painted in New Orleans on Fat Tuesday). The work is stoic, somber and gothic, yet it also declares a syncretic relationship with games, festivals and a general joie de vivre. Not exactly the easiest stew of aesthetic directions to digest. Essentially, this is spicy food. Grgich's work is considered outsider art -- which focuses on untrained and often anti-academic artists who create with rough/rustic materials outside of highbrow material consciousness and the traditional cultural legitimacy courted by more sales-driven artists. The genre is extremely well regarded (it became the vogue after the art-market collapse of 1989 as a return to integrity) and Chicago is probably the best place to take in a lot of it. In fact, Grgich was a cover artist for Raw Vision Magazine in 1998. For those unfamiliar, Raw Vision is outsider- and tramp-art's premier publication. You don't see outsider art much in Portland, probably because the West Coast in general is "taste-wise" insecure. In other words, most of the art, furniture and architecture focuses more on oblique quality signifiers like finish (fashion), craftsmanship and material. I can forgive furniture and architecture for this because there is a practicality to pure craftsmanship. But if the art is too polite it is dead. Grgich's "Oblong Head" is anything but polite. Yep, I can see all the Oba-goers on First Thursday gazing upon the crusted/turgid/sparkly surface of "Oblong Head" with lost and puzzled looks. No, Victoria, Prada and tramp-art don't mix. The crusted surface leaves one with a sphinx-like puzzle that one should never want to solve. Real taste is about accepting and relishing dramatic differences without trying to impose homogenizing common denominators. It is the difference between the menu at Denny's and an authentic Ethiopian restaurant.